A grizzled, elderly fisherman (and former university professor) calling himself by his “nom de fishing pier,” Baitshack Ben, stood at the end of Bob Hall Pier looking at his line angling off into the Gulf of Mexico. When asked if he ever goes out on fishing boats, he says, “Boats! We don’t need no stinking boats,” laughing at his own lame take on the bandits in the classic movie Treasure of the Sierra Madre. Those are familiar sentiments on the saltwater fishing piers dotting the Texas coastline. The fishing is often good, and people are relaxed, friendly and generally helpful to one another — in fact, Baitshack Ben’s moniker comes from his habit of giving away bait. And sometimes that help can come in more dramatic ways. Only a little earlier, everybody on the end of the pier began hearing the hiss of line flying off a reel. They knew instantly that somebody hooked a big one. Jacko, an intense young man in a ragged Aggies T-shirt, didn’t listen. He pulled back hard, almost bending the rod in half. Everyone looked up to see if it would snap. Finally, he eased off and began moving in the direction the fish was running, but there were other people in the way. In fact, Jacko’s line was already crossed with another fisherman’s. They quickly changed places, untangling their lines while Jacko tried giving up more line and yanking back on the rod at the same time. Suddenly, the fish changed directions and seemed to be coming back toward the pier. It was cut, but then Jacko’s line went slack. For a moment, no one knew what happened. Then it suddenly went tight again. The fish had passed right under the pier. “He’s headed offshore,” said Jacko. The problem now was that Jacko was trying to play the fish with his rod in the wrong direction from the wrong side of the pier. “We can pass it under; we’ve done it before,” yelled one of Jacko’s friends. They tied a rope to the handle of the rod, and someone on the other side of the pier picked up Jacko’s line with a hook on the end of a chain. They passed the rod under the pier. Jacko grabbed it and resumed the struggle, finally landing his fish. People cheered. It was about a 30-pound jack-crevalle, and it was still fighting mad. Jacko threw it back. They aren’t good to eat. Saltwater fishing piers attract a wide variety of anglers. Many are occasional visitors or tourists trying their luck. 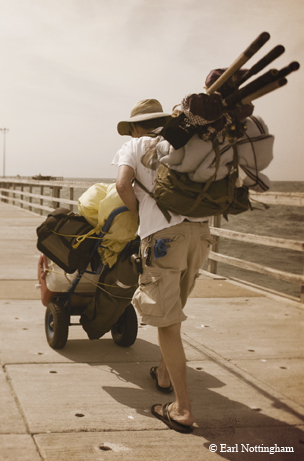 Many are truly dedicated, hard-core fishermen who come fully equipped with folding chairs, ice chests, big tackle boxes and various rods and reels, all of it brought out with some form of pushcart. They stay out on the piers for hours or even days, and they are the ones who catch most of the fish. Cecil Tackett falls into that category. A tall, easygoing electrician, Tackett and his wife got tired of coming all the way from Fort Worth to go fishing every month or two. They would fish the whole weekend and then drive home exhausted. So they solved the problem by buying a house in Flour Bluff, near Corpus Christi, just so they could go saltwater fishing more often. Fishing generally improves in the spring, when the water begins to warm up. And that brings out another pier specialist, the shark fishermen. 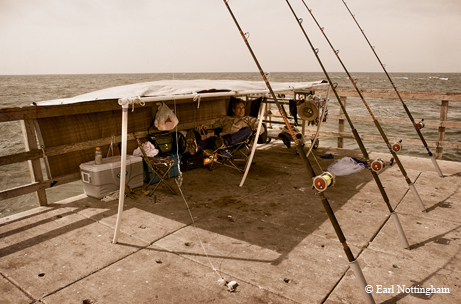 “They are a whole different clan of fishermen,” says Bryan Bartram, TPWD fisheries technician and avid shark fisherman. Usually their sole focus is on shark or even certain types of sharks. Their equipment is scaled up to suit their quarry — some sharks can weigh hundreds of pounds. They use huge reels that can measure 10 to 11 inches across. These rods are often custom-built, heavy-duty rods with ultrastrong lines and leaders. Bait can be a whole mullet or stingray. Shark fishermen looking for really big ones like tigers will sometimes take their bait offshore in a kayak and drop it off. “Shark fishing is a waiting game,” says Bartram. “Over a couple of days you might get three pulls and actually hook only one shark. But it’s worth it to me. There is just no comparison to hooking and fighting, say, a 5- or 6-foot black tip shark and catching a 16-inch trout.” If it’s more than about 3 feet, Bartram lets it go. Just about anything can be caught from most saltwater piers, but, like people, fishing piers can develop their own special characteristics. Horace Caldwell Pier at Port Aransas is only about 20 miles from Bob Hall, but anglers tend to catch different numbers of different species there. Part of the reason is that Horace Caldwell is less than a mile from the Corpus Christi ship channel. The ship channel is at least 40 feet deep and is not only a busy passageway for shipping and boat traffic but also a major fish highway. The ship channel is “a main route for black drum, redfish and flounder migration offshore,” says Trial. This means that Horace Caldwell has a much closer proximity to very hungry migrating fish. The fishing pier at Charlie’s Pasture, just west of the ferry landing and the Brundrett Pier on Station Street in Port Aransas, can be a real hot spot. Even in one of the slowest times of the year for fishing, January and February, there were folks out on Horace Caldwell who had driven down from San Antonio and Austin just to fish the piers and jetties. They were catching mainly stingrays and catfish on the pier, but elsewhere around Corpus Christi Bay there were black drum, redfish and speckled trout being taken. Some people, like Greg Kellogg, were out just to enjoy the day. A former computer expert for the Department of Defense, Kellogg says he has caught just about everything. “I just like to be out here. Fishing is relaxing. Catching them is work,” he laughs. One thing that successful pier and jetty fishermen have in common is a sharp eye on the weather and water conditions at any given time. There are saltwater piers pretty much all along the Texas Gulf Coast from Port Isabel to the Sabine River with one glaring and unfortunate exception — the Galveston area. 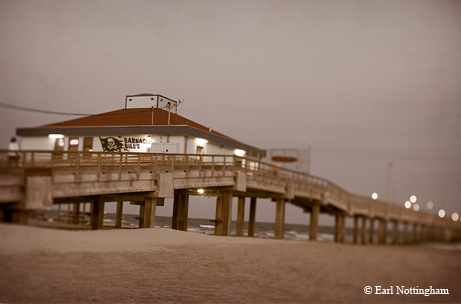 Of the eight piers in or near Galveston, seven were damaged or destroyed by Hurricane Ike in 2008. Seawolf Park, within the city of Galveston, has the only pier left functioning.